Fall Armyworm feeding on maize in Malawi. | FAO. ROME (FAO)* – Fall Armyworm keeps spreading to larger areas within countries in sub-Saharan Africa and becomes more destructive as it feeds on more crops and different parts of crops, increasingly growing an appetite for sorghum and millet, in addition to maize. The pest could spread to Northern Africa, Southern Europe and the Near East, warned the United Nations’ Food and Agriculture Organization (FAO) on 28 June 2018. The agency called for a massive scaling up of the Fall Armyworm campaign to train more than 500 000 farmers to manage the pest through Farmer Field Schools in sub-Saharan Africa. “Fall Armyworm could leave 300 million people hungry in sub-Saharan Africa, having already infested maize and sorghum fields across 44 countries in an area of more than 22 million square kilometres – the combined area of the European Union, Australia and the United States,” said Bukar Tijani, FAO Assistant Director-General and Regional Representative for Africa on the sidelines of a resource partners’ meeting in Rome. “We have developed tools and put measures into place to tackle Fall Armyworm – from training farmers and extension workers on how to apply “local remedies” such as collecting Fall Armyworm larvae killed by naturally occurring pathogens, making a mixture of these pathogens and applying them on the infested crops to kill the pest, to equipping them with mobile apps so they can recognize their new foe faster, and get immediate advice on how to manage it,” he added. “Farmers trained in Fall Armyworm management can now detect infestations earlier, are able to protect their crops better, and report less damage. The foundation is there. We just need to build on it – train over 500 000 farmers through 20 000 Farmers Field Schools across sub-Saharan Africa this year, support highly vulnerable countries where Fall Armyworm is widespread and capacity to manage it is low, develop resources in local languages, and get governments up to speed on sustainable Fall Armyworm measures, such as the use of bio-pesticides,” said Tijani. At the meeting, resource partners highlighted FAO’s coordination role in tackling Fall Armyworm, and expressed support for FAO’s integrated pest management (IPM) approach, which means managing Fall Armyworm in an effective, and economically and environmentally sustainable way. FAO took immediate steps as soon as FAW was detected in Africa, including: bringing together experts to share knowledge and experiences on sustainable Fall Armyworm management; developing tools (farmers’ manual, mobile apps, web-platform, FAWRisk-Map) to build better warning, monitoring and response mechanisms; and supporting countries to mitigate pest damage, develop action plans and policies, and train extension workers and farmers. More than 30 FAO-supported projects are rolled out across the continent to fight the pest. These include training 20 000 farmers and frontline extension workers to date as part of FAO’s Farmer Field Schools to recognize and report Fall Armyworm infestations and use mechanical control, such as crushing of the pest by hand, and apply bio-pesticides (neem, tobacco plants) and natural enemies (ants) to destroy the pest. 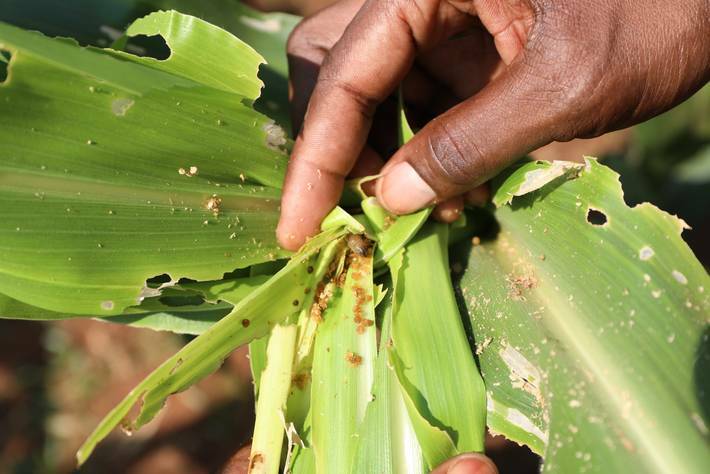 FAO also developed a framework for partnership so that organisations joining the fight against Fall Armyworm can follow guidelines on sustainable management of the pest when developing their projects and programmes. (SOURCE: FAO).